A MAJOR collision, involving a ‘number of vehicles’ has closed one of the county’s major highway routes today (June 1). Police, fire and ambulance crews have rushed to the A24 in Findon following a crash, which involved a bus, motorbike and a number of other vehicles. The incident took place at the junction of Findon Road and Allendale Avenue shortly before 4pm with rescue efforts remaining on-going. “The road could remain closed for a number of hours,” a police spokesman has said. Anyone with information should email collision.appeal@sussex.pnn.police.uk or call 101 quoting Operation Redtail. The incident is just the latest of a series of crashes across the area which have caused motorists misery today. In Rustington, a 26-year-old man from Worthing was flown to hospital when his black Vauxhall Astra slammed into a lamppost and a tree. This collision, in Ash Lane, was reported to police at about 9.50am. 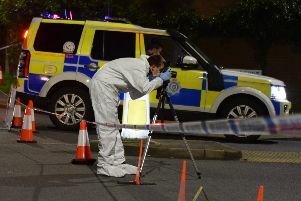 The car had been travelling northbound when it crashed at the junction of Woodlands Avenue. The driver was flown to St George’s Hospital in London suffering from a serious head injury. The road was closed between the junctions with The Street and the Mill Lane roundabout for about two hours while the recovery process took place. Anyone with information should email collision.appeal@sussex.pnn.police.uk or call 101 quoting Operation Langside.